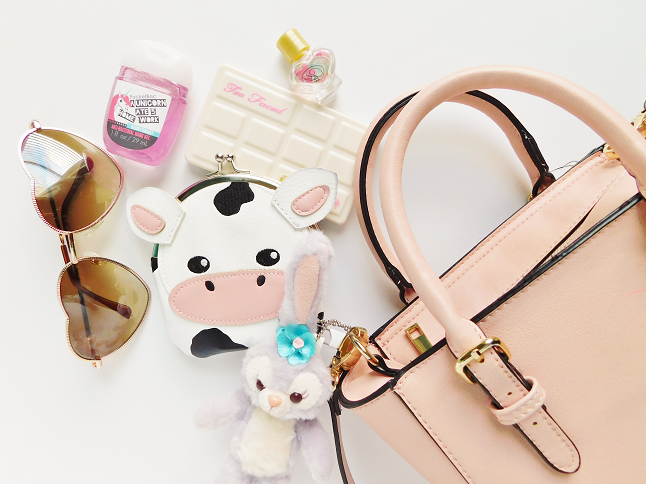 You know it's the start of my summer series when I show you guys my updated what's in my purse post. I've noticed in my past what's in my bag posts that I am always using my Rebecca Minkoff Mini Mac purse but this time I am finally showing you a new bag that I've been using off and on for the past year. I don't think I carry too much with me but I will let you be the judge of that. This is the bag that I am currently using. 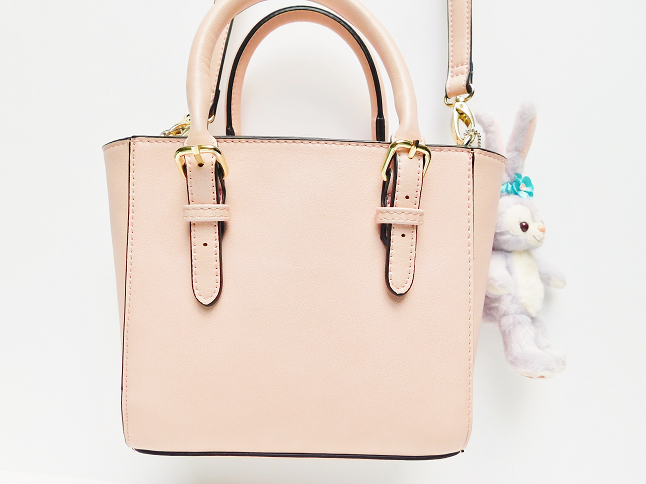 This is a pale pink colored bag from Forever 21. There is lots of space inside so I can store a lot inside. The only downside is the zipper, it isn't sewn completely across the bag so it makes it difficult to zip open and close. On the side, I have my Stella Lou keychain. She's just chilling on the side. 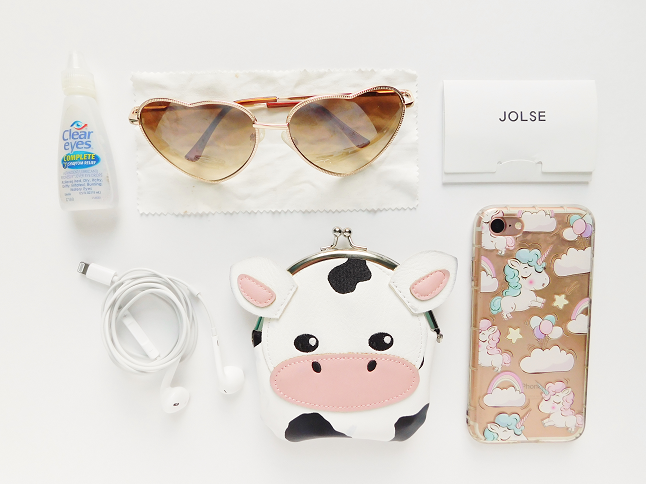 Starting from the left I have some eye drops (I get very dry eyes), earphones, heart-shaped sunglasses with a wipe to clean them, my cow coin purse which I keep my cards, cash and coins inside, oil absorbing sheets and finally my iPhone 7. Here are all my beauty goodies. This section is always changing depending what makeup I am wearing that day. 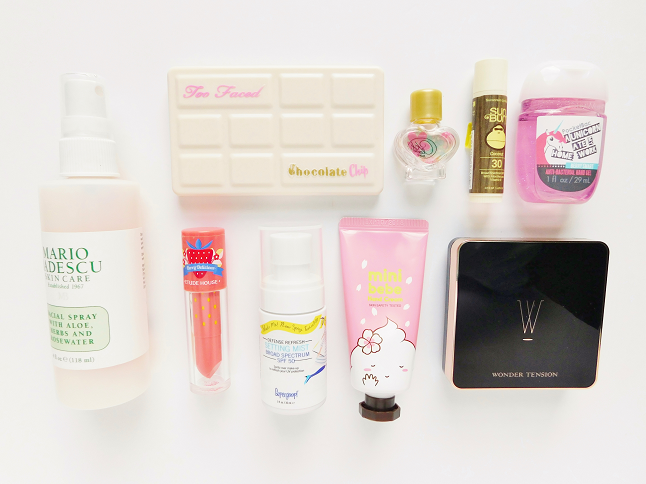 From left to right, Mario Badescu Rosewater facial spray, Too Faced white chocolate palette (great for traveling), Etude House lip tint, Supergoop! setting mist, It's Skin Mini Bebe hand cream, mini perfume bottle, Sun Bum lip balm, A'PIEU Wonder Tension moist cushion and Bath and Body Works unicorn anti-bacterial hand gel (it contains glitter! ).